I would call her "Smudge". 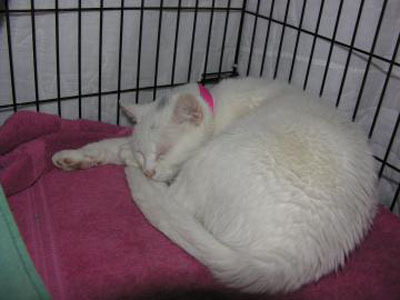 Momma is a 2-year-old female cat, who is all white with a dash of gray on the top of her head and wonderful yellow eyes. She was found with her four kittens in October, and they were all brought to Lollypop Farm for a second chance. The kittens have all been adopted, now Momma is hoping to find her own forever home! This very sweet and loving cat is a quiet girl who loves to have her head scratched. Her gentle kneading shows how much she loves the attention. Momma is hoping to find a Home for the Holidays. She is one of our Featured Felines: Purrfectly Patient. Now through Sunday (12/26), adopt her for just $25, or any other cat, 5 months or older, who has been here 1-month or longer. Cayous the dog from last week, was adopted!.